Embroidered Scrubs for Medical Personnel | Ace Uniform Services, Inc.
Is it a good idea to invest in custom embroidered scrubs for your employees? You know that there are many things you have to invest in for your medical office. 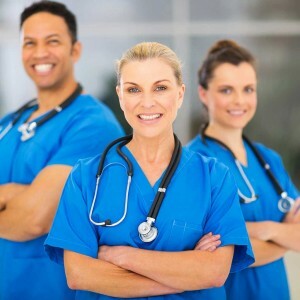 You also know that scrubs are the go-to uniform in the medical industry, and when people walk into your medical business there will be an unspoken expectation of seeing them. Is it a good idea to invest in custom embroidered scrubs for your employees? Are they worth the cost? The number one reason to have a standardized uniform policy is that it presents a professional image of your staff as soon as a prospective customer walks through the door. Having a standardized logo enhances that sense of professionalism, and making that logo embroidered does it even more so. Embroidery offers clean lines in a crisp logo that won’t fade or get scratched and inconsistent over time. Any standardized uniform creates a sense of belonging, but embroidered scrubs can help your medical professionals feel like they are part of the team. When you offer custom embroidered uniforms, it solidifies each employee’s individual sense of acceptance, more so than wearing generic scrubs that anyone could buy would. The cohesive looks of a branded uniform also have a unifying effect on the team, reminding both customers and employees that they are part of a unit, and not working alone. In general, people tend to associate brands with better quality, assuming that the store-brand soda won’t taste right or the off-brand soap won’t clean as well. This assumption follows through to their views on employees too. When prospective customers walk in and see a consistent branded uniform on your employees, it will increase their sense of trust in your business. Moreover, embroidered logos look more high-end, so seeing that you’re willing to invest the time and money in custom embroidered logos for your uniforms will imply that you take the same time and care in your other business choices. This carries over to brand recognition. Those positive thoughts about your logo easily become positive thoughts about your brand overall. And your employees will carry that brand with them out into the public before or after their shifts, whether they are simply stopping for gas or going out to get food. When you spring for custom embroidered logos on your scrubs, your employees become little walking brand advertisements wherever they go. This entry was posted on Friday, November 30th, 2018	at 9:15 am	. You can follow any responses to this entry through the RSS 2.0	feed. Both comments and pings are currently closed.